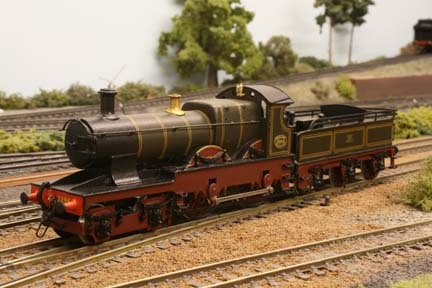 This is a very interesting model for all those Great Western fans who want something a little bit different. 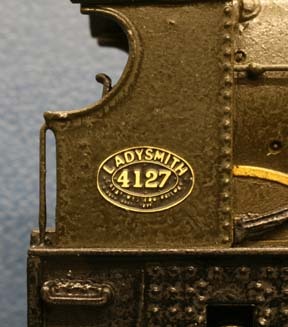 No.4127 "Ladysmith" is an 'Atbara' class loco, and was the result of a kit modification project, using a Nu-Cast 'Flower' kit as a basis (for a picture of a 'Flower', see page 12). 'Atbaras' were the forerunners of the famous 'City' class, and as built between 1900 and 1902, had parallel boilers (see below). However, they were the subject of boiler experiments by G.J.Churchward, and latterly the boilers became tapered, or coned as the GWR called them, and eventually received superheaters and top feeds (circa 1915), as in this model. With tapered boilers, 'Atbaras' looked very much like the later (1903 built) 'Cities', but featured the smaller standard no.2 boiler, instead of the 'City's' standard no.4 unit (the 'City' boiler being six inches larger diameter at the smokebox end). A total of forty 'Atbaras' were built, but ten were subsequently rebuilt with larger no.4 boilers and transfered to the 'City' class. The first twenty-three 'Atbaras' were fitted with the large oval combined name and number plates on their cab sides, which makes them rather distinctive. 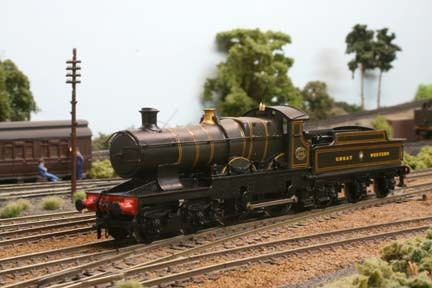 Other members of the class carried the normal GWR name/number plate layout, as found on the 'Flowers' and the 'Cities'. The first batch of names incidentally, were derived from places, battles, warships and people who were associated with the Sudanese and Boer campaigns that were being fought, and subsequently reported on in the newspapers at the time - Atbara is the name of a city in the Sudan - the site of a battle in 1898, whilst Ladysmith is a township in South Africa, which was besieged during the Second Boer War in 1900. This loco is the first in a number of 'Atbara' projects that I have been commissioned to build, and more examples will be featured as I complete them. A parallel-boilered 'Atbara', carrying the lovely Indian red-framed livery - basically the as-built condition, circa 1900 - 1902. 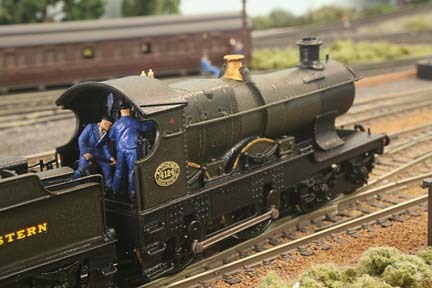 This project involved a little more 'kit-bashing' than the loco above, with an etched nickel-silver boiler section being substituted for the cast white-metal tapered one normally supplied in this kit. The loco also features open coal rails on the tender, and the eagle-eyed amongst you will notice that there are no sand boxes in front of the driving wheel splashers - this feature being added later on in the locos' lives. When first built, these locos were numbered in the 3373 to 3412 series, and this is No.3394 "Adelaide". Along with all the other outside-framed GWR 4-4-0s, they were renumbered in 1912 - "Adelaide" then becoming No.4140. "Atbara", the doyen of the class, in the lined green 'garter crest' livery, with top feed and superheater, and after renumbering to No.4120 in 1912. Here is my 'Atbara' - No.4124 "Kitchener". 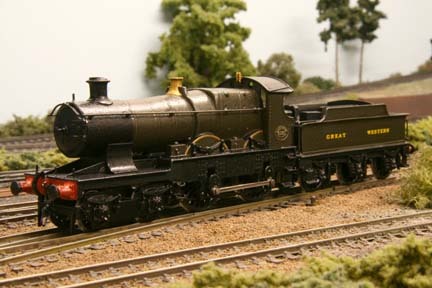 This loco will eventually feature on my new Great Western 1920s era layout.